Every summer since I can remember my family and I have graced the southern Portuguese coast and lounged around on many a beach and pool sun bed. When I was a kid, I spent most of my time eating ice cream, getting a sugar high, and then running around until it was time to go to bed. These past few years though, the inner travel blogger in me spent a little more time hunting down some fun and arguably alternative things to do to. 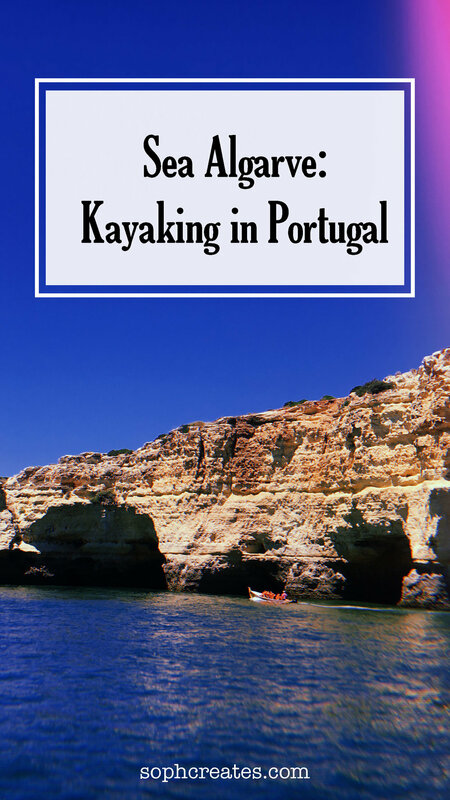 Enter Sea Algarve, a great day out kayaking along the coasts of the Algarve and finding some of it's hidden caves and beaches. George and I decided that it'd be fun to spend the morning kayaking and while it was a great way to spend the morning. We opted for a double kayak, which proved to be a nice test for our teamwork skills! The trip itself lasts about 4 hours, an hour and half of which are spent on a boat ride to and from where you will be kayaking, with the rest of the time spent exploring the coasts and even stopping off on one of the "secret beaches" for a quick break. We started out the trip on a small boat, which carried us and about 15 other kayak and paddle boarders. Our guide told us we'd be going on a 45 minute boat ride west towards where we would begin kayaking and kayak for about 2 hours from that point. The boat ride itself was really nice, the sea breeze helped me achieve the perfect beach waves and we got to see some of my favourite beaches from a new angle. We even spotted a pirate ship! Not real pirates, but the ship was straight out of Pirates of the Caribbean. Our time actually kayaking was a fun experience but the water was freezing, especially for the end of July! We made a pact not to splash each other with the paddles, and ended up braving the cold waters when we stopped off on one of the many hidden beaches. The beach we were guided to, was unfortunately not one of the cool secret cave beaches, but rather a small beach surrounded by giant cliffs. Even though this was still a super cool experience, we did have to kayak past another company who had taken their kayakers into a cave beach with a natural sun roof. It was disappointing that we couldn't experience that too, but c'est la vie! Overall the trip was not what we expected, but fun none-the-less. If I were to do this again, I definitely would pick an afternoon slot as we were super tired in the morning and the Atlantic ocean is always freezing in the mornings! We also found out after we got back on land that there were a few other kayak companies, which also did what we did for cheaper and at closer beaches. So maybe next time, we'll try out one of those! This is not a sponsored post, I just really wanted to kayak and then decided to write about it.